Most of us have been around financial statements for so long that we take their use for granted. As a result, many of us don’t question when a financial report includes 50 or more pages of footnotes. We don’t question whether the “earnings report” is actually linked to higher profits. We don’t question how a company comes up with its numbers. Two experienced accounting professors in the The End of Accounting and the Path Forward for Investors and Managers argue that it’s time to start questioning. What is The End of Accounting About? The driving force (and controversial idea) behind The End of Accounting is that financial statements are a complicated mess when they don’t have to be. Throughout the book, the authors question the reliability and quality of earnings reports, balance sheets and everything else traditionally reported to investors as a sign of business performance. Numbers, they say, without the appropriate context, have been manipulated, distorted or even omitted without most investors even knowing about it (despite the regulations and 50+page footnotes), the book claims. In short, the authors say we can do a whole lot better. The authors of the book don’t call for everyone to throw out their financial statements just yet, but they do propose a better type of report to supplement the data-heavy financial statements called the Strategic Resources & Consequences Report. The Strategic Resources & Consequences Report is a financial document that brings more context to the numbers on a financial document, like a balance sheet. To provide an example, the Strategic Resources & Consequences Report would discuss a business’s new venture and how this venture might impact that business beyond the numbers put together by the accounting department. Numbers are important in the business world, the book argues, (especially for investors, suppliers and creditors) but so is the story behind those numbers. 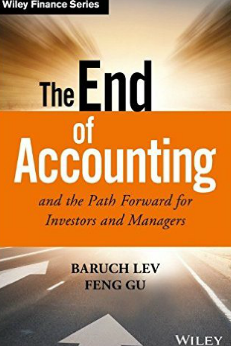 The End of Accounting is partly the work of Baruch Lev, an accounting and finance professor at the New York University Stern School of Business and director of the Vincent C. Ross Institute of Accounting Research. Co-author Feng Gu is an associate professor in the Accounting and Law Department at the University of Buffalo. Both authors are award-winning academic researchers in the areas of finance and accounting. What Was Best About The End of Accounting? The best part of The End of Accounting is the challenge the book issues. Essentially, the book asks, “Are we doing accounting the best way?” That is a very challenging notion if you accept the book’s assertion that accounting is going in the absolutely wrong direction and will continue in that direction if it doesn’t change. A second best part of the book is the large amount of evidence it provides to back up its challenge. The book goes to a great deal of effort to make it’s case. And the results are very convincing. The downside of the book is that you really need to be technically competent in investing to truly understand some of the points being made. The book quickly gets into things like regressions (Chapter 3). Readers can understand the book’s main concept without it, but it can be a little intimidating. The book also spends a lot of extra time defending its position which might be extremely helpful for those interested, but may be distracting to those readers who want a quick overview. Why Read The End of Accounting? If you have ever wondered (and I mean really wondered) why financial statements seem to require a Ph.D. to decipher, then this book may be for you. The book is an extended discussion (a bit heavy on the academic side) about why and how accounting needs to become more user-friendly. As the book wisely points out, we are in an age where just having numbers won’t cut it anymore. This book takes that discussion and provides a possible solution. If you are in any way, shape or form connected to financial reporting, this might be a book worth considering, just for the challenging ideas behind it alone.